Enable Your Business with an Ablesites Website! A Website that Gathers Business Leads for You 24/7 for Less than You Could Ever Imagine! Every business owner is interested in getting new business as easily and as cost-efficiently as possible. It costs much more to get a new customer or client than it does to retain an existing one. So a website which gathers new business leads round the clock is going to be of great interest to any business owner or manager who cares about the bottom line. Over the years, people considering buying a website for their business have become accustomed to good websites costing a huge amount of money. Decent business websites cost thousands, right? Well, that’s what people have been brought to believe. The fact is that there are too many web designers and SEOs who spend most of their time doing nothing, which is why, when they do work, they are so expensive; they are subsidising their idle days and their customers are paying for it! Well, we decided to change that by sourcing some great web design and development talent which is generally quite busy and therefore not expensive. We also know where the specialists are. We can pass the cost efficiencies onto our clients without losing any quality. So we started off at the front of the sales funnel with a website which had all the basics, and then we made optional extras available to those businesses who wanted and needed them (so that no time is wasted asking questions about whether something was available, because it always was available if needed). The outcome was that we are able to use these economies of scale to bring the price of the website down to an unbelievable figure. A website that would normally cost $3,000 or $4,000 could be made for less than $700. Then we asked businesses what they wanted in a fully equipped website (from their business point of view, not from the web developer's point of view). We want to be able to edit small changes, not have to pay money to web designers to change things whenever we change our phone, add a mobile number, move address, etc. Fully upgradeable: it has to grow as my business grows, and no rebuilding from scratch, which is expensive. 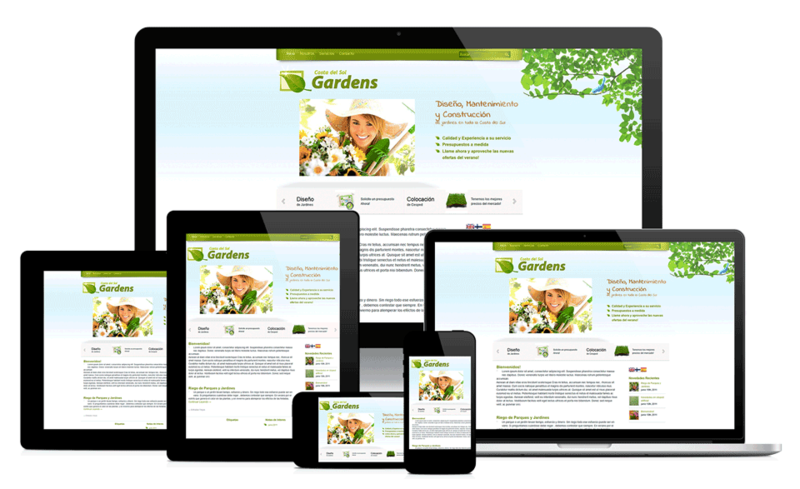 Fully responsive site: looks great on all devices including laptop, mobile, tablet, desktop, TV, etc. Now, how much do websites like these cost, that do all of the above, which look great and which collect business leads for you round the clock? Four thousand? Five thousand? Full ecommerce capabilities, with online shopping facility, shopping cart and secure payment processing. We work closely with our clients to ensure that the finished website is everything that the client could hope for. Now I'd like to explain what each one of these features means to you as a business owner, and how each one of these features can benefit your growing business. We will look at all of the possible choices for the best domain name for your website, based on the search volumes of all options. Then we look at the competing domains and evaluate which of the short list of domains is the best choice for your business. This is a free service at the start of the website building process, but it is the most important; because if this isn't done properly, everything that follows will be equally out of step. Depending on which hosting service you use, you can register your .com domain free. Your website will work for you at all hours of the day and night by collecting business leads for you. People will enter their name and email address in order to find out what's in it for them. Your phone number will feature prominently on your website; while names and email addresses will go directly for you to follow up when you’re ready. The email facility is always there 24/7 and 365 days a year. Your prospective customers will enter their details in order to get a free report (which we will write for you and with you, supplying positive information about your business which your prospective customer will be eager to learn about). You know that it costs much more to gain a new customer/client than to keep an existing customer/client, and this is the best way to get new ones with hardly any effort at all! The website is written using the latest HTML5 and CSS3, and also uses PHP scripting in parts. This means that it looks great in all formats (including mobile, laptop, desktop, tablet, TV, etc.) with graphics, tables and different sections slipping into place discretely depending on which device is being used to look at the site. The way your business will appear to the world will be highly impressive, whatever the medium. As an example, have a look at the image above. This shows how responsive websites typically look and resolve themselves in different devices. Now look at this same page on a different device to the one you're using now. See how it changes its size in order to accommodate itself to the new format? Websites which are written to be responsive in all devices look fantastic in any device that is used to view them. A lot of business owners get their website built then wonder why it’s buried away on page 2 or 3 of the search results where nobody can see it. Then they get someone to “do the SEO" afterwards. This always costs a huge amount of money because it is a difficult and clumsy way to go about it. Also, it won't work that way. SEO isn’t something that can be bolted on afterwards: it must be congruent with the design and build of the website; it must be part of the site from the word go, otherwise it won’t work properly. Nature doesn't make a tree then add the grain of the wood later on! This is what gives websites the coveted ‘https://’ before the domain name. At the risk of stating the obvious, this denotes that the site is a secure site. It also has advantages in that Google has already stated publicly that such secure sites will have better ranking in the search listings than non-secure sites, all other things being equal. Hence more site visitors, therefore more business leads for you. Note: Nobody can guarantee a top placing in the search engine results. Google's algorithm is a huge mystery, so no claims can possibly be made about getting you to the top of the search listings. It doesn't matter what the salesman who sold you your present site told you: if he told you that, then it was a lie. All we can do is promise that we will get you the best placement near the top as we can, and that is only possible with a well-built, robust and properly optimised website, and with a sensible Local SEO campaign to accompany it. Along with the good, sensible business hosting that we recommend, you have up to 100 potential email addresses based around your website’s domain name. Thus each person in your business can have their own address (john.smith@website.com and anna@website.com) and you can have a separate address for each department (such as sales@website.com and accounts@website.com). This is also useful when you want to check how successful individual marketing campaigns have been. So you can run an advert in the Evening Standard for ten weeks and have a different address for each week of the campaign; clearly you can then measure the success of each advert on a week by week basis (by the response to es1@website.com, es2@website.com … es10@website.com) and the same for different publications on different weeks, etc. The return email address can be hard-coded into the advert or campaign so that there is no chance of error. This allows access your social networking and business networking accounts directly from your site. Let us know at the design stage if you have any other such accounts and we’ll add their connectivity into the mix as well. Not just a handy attribute; this also ties in nicely with the citations aspect when it comes to your Local SEO campaign. Don't be scared by yet another bit of jargon. HTML stands for HyperText Markup Language, which is the scripting convention used to write (thereby create) websites. An HTML editor is an editor which enables you to create web pages, or change the appearance and content of existing web pages (either by working with the design interface, which is easier, or the code interface, which is less easy). It's free and it works well. Actually it's very similar to Dreamweaver, which is the industry standard editor used to create and edit web pages, and that costs a lot of money (its current owners, Adobe, won't sell it to you but will charge you about $60 per month; much like Microsoft Office, only more expensive), so the value of having such an editor at no cost is considerable. This is for you to make edits and is really easy to use: if you can use a word processor then you can make changes to your site using this software. Most website owners have to go limply to their web developer with their credit card every time they want a tiny change made to their site such as a different phone number or a change in personnel or business hours. With an Ablesites website you won’t ever need to go to that expense or hassle. Make those small changes any time you like. This goes with the editor. Whenever you make a change to a file you must upload it to your server for the change to take effect. This enables you to upload files whenever you like literally with one click of a mouse. Once your site’s permanent settings are entered into the software it’s ready to run whenever it’s needed. These are available whenever you need them (although you probably won’t need them) on everything even slightly ‘technical’. As technology improves so will your business and so will your website. When this happens, you’ll get a chance to get free updates of versions you already have, for the life of your site and your business, with no extra cost. These all play a part in Local SEO these days. Your site may need more or less of these, depending on the competition in the locality and the sector you work in. You may not need any additional help at all if the competition is low. An audit will tell what is necessary (but only if you want one). Ongoing maintenance will keep your site at or near the top of the listings, depending on the number of competitors in the same area. The extent of the maintenance which is necessary will be the result of the 'difficulty' of the sector, the number of competing businesses in the local area and the competitiveness of the keywords used in your business sector. There is plenty of scope for SEO campaigns if you want to spread your site’s sphere of influence beyond your immediate locality. Most local businesses will not want this option, but it is available if you do. The vast majority of Ablesites websites will be businesses serving a local town, cluster of towns, or perhaps even a whole county. Very few will aim at a national market and even fewer a global one. But for those that do there will be an SEO campaign to meet this need. We actually started off as SEOs, so we know very well how to meet this challenge if it becomes necessary. The email capture system, where your prospective customers contact you in exchange for a free report detailing why they should choose you and not your local competitors (which we will write for you, with your help) offers you two choices. The first is a no-cost email link which the prospect will click on and which will send his or her email to your inbox, alerting you that they are interested. The other, paid-for, option is much better: the well-established and trusted email marketing service Aweber. Both systems require that we put some code on your site. But the Aweber version will send you the prospect's name and phone number as well as their email address, and will allow your free report to be emailed back to your prospect automatically. If you want to run email campaigns then you should consider getting third party integration using Aweber. They are truly a world-class company. You can set up multiple email campaigns, send out broadcast emails, do A/B split testing within your Aweber account and a lot more. The fact that Aweber is well-known in the Internet marketing industry means that service providers are far less likely to consider emails sent by Aweber as spam, therefore your emails are going to enjoy a very good open rate, with a corresponding low bounce rate. Aweber's service costs $194 a year. We've been using them for nearly 20 years and they're worth every penny. We can attach a Wordpress blog to your site so that you can update content on a daily or weekly basis, which is great for getting new business and for keeping existing customers aware of news or special offers you may want to run. By subscribing to different syndication systems which are highly targeted to your own industry you can develop authority for your website and traction for your newsletter. You can also schedule syndication of new content to update on a regular basis. This is more useful for some businesses than others. It's there if you want it. Again, only certain types of business will find this useful. A range of forum types is available. If your business thrives on discussion and debate then you will probably want a forum. It is also good from an SEO point of view because of the additional content which a forum provides, which is picked up and indexed by the search engines. If your business involves selling products then a catalogue or portfolio section is available in several different formats including the ever-popular Joomla. This is configured with full SEO to all pages. A choice of different galleries and slideshows can easily be attached onto your main site. This option would be suitable for the creative industries. For those who want ecommerce capability, a range of graded options are available. At its most simple, you could have a ‘Buy Now’ button from Paypal directly on your website (as it is in this site) which could be set up in minutes. For more sophisticated needs you could integrate a shopping cart with merchant processing, right up to the full ecommerce package which may include migrating to other platforms if your volume of sales was sufficiently high. With ecommerce sites we would also recommend upgrading your hosting to a dedicated server in order to accommodate the anticipated increased volume of activity. The above is an overview of what you get, firstly with the basic version of the website (which, in itself, is very wide-ranging in its scope and capabilities), and latterly what you get with the paid optional extras. Remember, you will never pay for what you don't want and don't need. No doubt you will want to know about the cost of this. On the following page is a detailed schedule of costs. So click here to go to the next page.